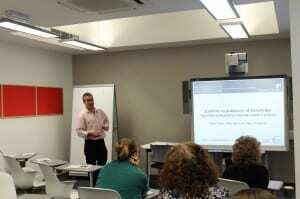 Blogging the Xerte Workshops: Tuesday 24th June. ‘Talking Xerte’ events are crucial to the curation of a project such as Making Digital History, and I attended two of these myself on 24th and 26th June. The former enabled Xerte pioneers to show what they have achieved; the problems they have encountered; and any future plans for their software. The software is still something of a “work in progress” but its vast potential was demonstrated by even the least experienced of users during this workshop. Dr. Antonella Liuzzo Scorpo and Dr. Jamie Wood took to the stage first; Making Digital History being just one of the projects on which they have collaborated. They also work together on one of Lincoln’s History BA modules, ‘East Meets West’, a first year module which introduces Xerte as an assessed group project; it ran for the first time in the 2013/14 year and attained a 100% pass rate on the Xerte assessment. 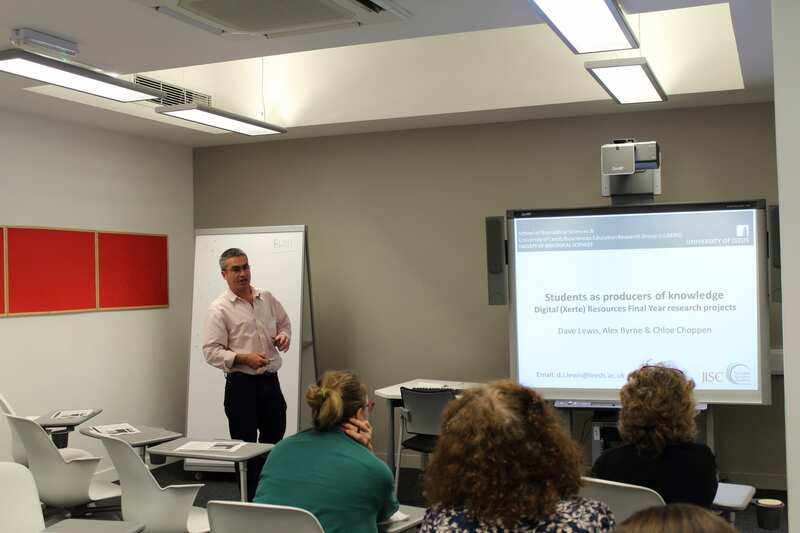 Their presentation was a brief introduction, giving an overview of how the History Faculty at Lincoln is using Xerte, laying down one of the major underlying themes for the day: the advancement of students’ digital literacy. Dr. David Lewis of the Faculty of Biological Sciences and two of his undergraduate students: Alex Byrne and Chloe Choppen, followed this point perfectly with their presentation. It was mentioned that many who study science at degree level may not go on to do a scientific career; so the use of Xerte gives students more evidence of valuable transferable skills to put on their CVs. The same can be said for any subject, History included, that graduates may not find employment linked directly to their BA degree subject, so a varied and challenging course with different assessments (such as the use of Xerte) is a huge bonus. Alex and Chloe have also assisted in the construction of a coherent and thorough Guide Book for the Xerte tool to give new users clear instruction and support. They also gave feedback on Xerte from a student’s perspective, concerning the central skills which can be gained from it: self reflection; time management; teamwork etc. The pair offered extensive feedback on Xerte itself ranging from its positive interactivity to its limited formatting potential. 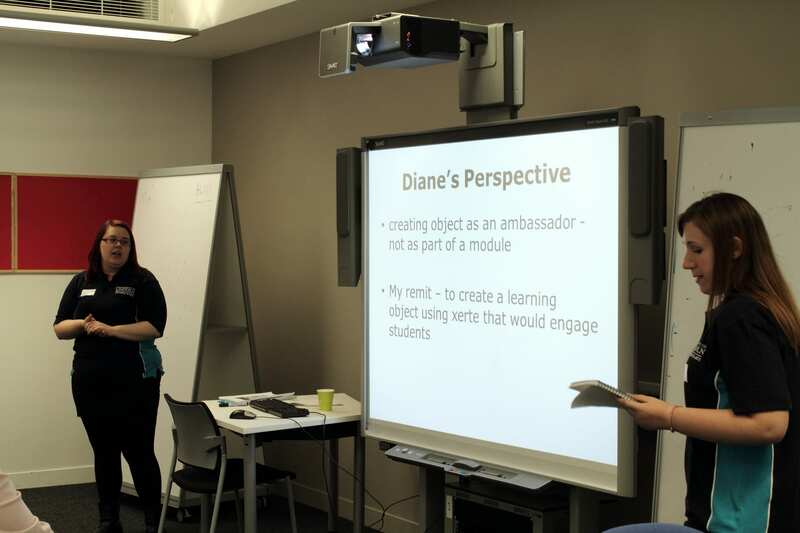 Two of the Making Digital History ambassadors, Paige Chapman and Diane Ranyard, also presented at the event. Both have done sterling work in helping grow Xerte in the History Faculty. They are working on bringing important documents to life with Xerte, one of which is the rather lengthy style guide, which has been condensed into an easy-to-use Xerte object. They also pointed out that Xerte made a very good revision source because of its interactivity. 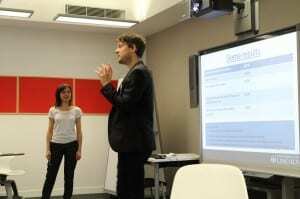 At the end of the day there was also a chance for the attendees to try their hand at Xerte for themselves. Some had never used it before but the outcome and feedback was all rather positive with regards to Xerte. There were some comments such as ‘it is a bit clunky’, or that ‘the videos don’t load properly’, but there was also a large amount of positive feedback from first time users. For many, Xerte gave the impression of a ‘trial and error’ program, many started by following the guidelines, but carried on without them once they had a feel for the program. On a positive note, it was also mentioned that Xerte was ‘more straight forward than expected’. Overall, Xerte is an extremely useful piece of software to create learning materials and to increase digital literacy; it is a very easy program to understand having learnt the basics, and its developers will be working hard to ensure any problems raised in feedback will be rectified. In my opinion, for it to be used to its potential in university assessments it is important to introduce students to it early on. This gives them the chance to jump the ‘daunting’ hurdle and move on to create even better objects in later assessments. This entry was posted in Biosciences, digital literacy, Dissemination, E-learning, history, Learning objects, OER, Open Educational Resources, Xerte and tagged biosciences, collaboration, digital literacy, e-learning, images, media, workshops, Xerte. Bookmark the permalink. 2 Responses to Blogging the Xerte Workshops: Tuesday 24th June. Here is a summary of my notes on the presentation by Dave Lewis and the students from Leeds and the questions that followed. Payment of student is important. Leeds student interns complete projects including on educational research and public engagement. Guidance is provided alongside the process of making the Xerte objects themselves, which develops a deeper understanding of the tool and how to use it. The focus is on the users (undergraduate students)) and what they would do with the tool – this is not something that we did so much at Lincoln. Leeds student interns reported developing skills in time management, team working, self-reflection (i.e. evaluating ways of working) and the ability to collaborate with fellow students and staff (e.g. skills like being diplomatic). An interesting suggestion was for students to publish Xerte objects and then having students review them via the comments facility there.